Super League aims to compete with rugby union in England, and North America. While Pearson would not divulge information on the changes in closer detail, one such matter could be the approval of more fixtures being taken overseas. Hull are due to play Wigan in Wollongong in February, the first time a Super League game has been played outside Europe. The proposed New York franchise – who want to enter the RFL in 2019 – will almost certainly host a Super League fixture in the US later this year if they enter, too. RLIF (International Rugby League Federation) has its membership policy now very clear in their website: http://rlif.com/about_the_rlif/membership_criteria. They have the Observer Member, which is something World Rugby doesn't have for countries with a very small scene (like all those countries in Rugby Union that are just members of the continental unions - Ecuador, El Salvador, Honduras, Nicaragua, Panama, Belarus, Iceland, Slovakia, Estonia, Lebanon, Saudi Arabia, Bangladesh, Egypt, Algeria etc... they all could be World Rugby Observer members....). Constitution correctly signed and approved. Bank Account with at least two dual-signatories drawn from the Board of the applicant. A list of the interested parties together with contact details, position within the organisation and a brief biography of the Board Members. A not for profit legal entity established in the country of the applicant organisation. Provision of founding minutes that clearly define founding members, in line with the constitution, and governing Board elections. A Development Plan for the following 12 month period. An organisation applying for Affiliate Membership must meet all Observer criteria. Complete and submit to the RLEF annual accounts for at least 12 months prior to application. Evidence that a Youth or Junior Development Programme is in place. A registered office and admin. Have an approved international programme at any eligible level. Operate coach and match official education via an RLEF approved scheme, and led by nominated and qualified technical managers. An organisation applying for Full Membership must meet all Affiliate Member criteria. Complete and submit to the RLEF annual accounts for at least 24-months prior to application. Publish and lodge with the RLEF annual reports for at least two years prior to application. Be able to demonstrate the financial stability of the organisation. Conduct regular rugby league competitions within the country – competition is defined as a 13-a-side league competition played under International Laws of rugby league over a minimum of a 10-week period. c) Minimum six-team junior club (or school) competition with each team playing a minimum of four regular season matches, not including play-offs. The age range of the competition may be anything from U14 to U18, with the six named teams all being of the same age category. Approved international programme at more than one level which must include full international and may in addition include “A” international, student, junior (Under 18 or younger) and wheelchair. All at Male or Female. Members may be able to source revenue from the above activity by way of fees. This can be extended to include registration fees, sponsorship, government grants, gate and canteen receipts and RLEF grants where applicable. An approved Development Plan, correctly resourced with annual reports lodged with the RLEF. Have a designated, active media manager and be able to show a functioning media operation. Some of the minor RL nations are just a few Union players running around, not taking things too seriously. That's how the domestic comp in the US is. Which is why professional expansion efforts like Toronto Wolfpack are largely bypassing the domestic setup. IMO RL's next big markets are eastern Canada and northeastern/midwestern USA. The problem is going to be players IMO, there just isn't the level of top quality talent available in Rugby League to sustain multiple news professional clubs in a market with such little infrastructure for the game. I'm still skeptical of the long term survivability of the Wolfpack and any other North American clubs if they are filled with foreign players. You still need the grassroots in place. 4N wrote: Super League aims to compete with rugby union in England, and North America. That piece screams inferiority complex. It's been the poor relation in England recently. They are growing in confidence though. 4N wrote: It's been the poor relation in England recently. They are growing in confidence though. What I find League does on the world stage is what Rugby does here in Australia with League here domestically. And that is worry about what Rugby is doing globally. It tends to stunt anything real in the long run. 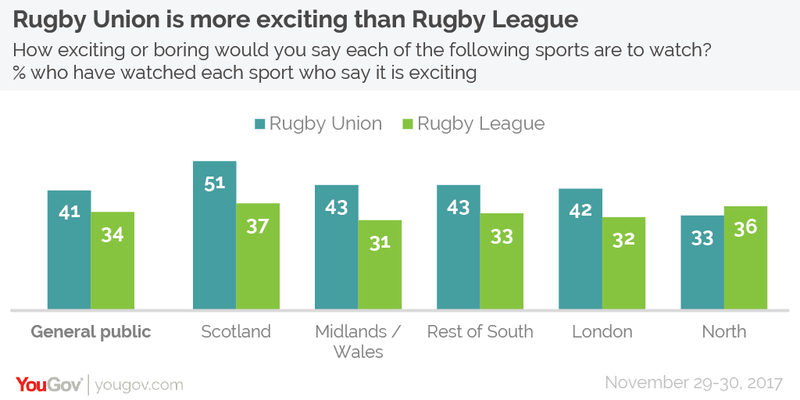 Official: Rugby Union is better to watch than Rugby League. Also side point; this is why talk of an Anglo-Welsh league will never go away. Wales has deep ties to the west and midlands of England, the rugby clubs are just reflections on this. Interesting survey. I dare say the results would be reversed down here. Sounds like Boston, New York and Hamilton, Ontario are in the works for expansion. Hamilton would be a good rival for the Wolfpack. 4N wrote: Sounds like Boston, New York and Hamilton, Ontario are in the works for expansion. Hamilton would be a good rival for the Wolfpack. It appears there may have been some truth to the theory that the Wolfpack were giving away tickets according to the local news. Interesting article on the challenges facing the club. To be perfectly honest it's not that surprising that a club fails to make a profit in its first year, this happens for many teams, the issue that's going to plague this club is having to pay for the travel expenses of the UK clubs. This same situation is ultimately what ended up killing the Perth Reds NRL team in the mid 1990's. Perth were allowed entry into the competition in 1995 on the condition they pay for the travel expenses of all the clubs due to the distance between Perth and the eastern states. A trip from Sydney to Perth back in '95 wasn't cheap. This included the Auckland Warriors too. It crippled the club from the start and they never recovered. thatrugbyguy wrote: It appears there may have been some truth to the theory that the Wolfpack were giving away tickets according to the local news. Interesting article on the challenges facing the club. The Wolfpack have said they don't expect to make a profit for their first five years. You can't expect a profit from a sports team for a very long time. The way they are usually justified economically is by their value increasing more than their accumulated losses. I should think the WP definitely have done that so far. Hamilton sounds like a great idea, these very close together teams and getting proper local exposure is a much better idea than the normal union way of spreading the teams out as much as possible. Most rugby teams struggle to break even let alone make profit. Of the 16 NRL clubs down here I believe only two have made profit over the last 10-15 years - Brisbane and South Sydney, and Souths only did it once or twice. Brisbane has been the only club to consistently make profit over several years, and even then it wasn't a great deal of money they banked. Toronto Wolfpack sponsoring a youth academy in Jamaica. Fantastic idea. Toronto kicked off the Championship beating Leigh in England, 34-12. I don't really follow the RFL Championship, but I guess Leigh is among the strongest teams, as they played last year's Super League. victorsra wrote: Toronto kicked off the Championship beating Leigh in England, 34-12. I don't really follow the RFL Championship, but I guess Leigh is among the strongest teams, as they played last year's Super League. Leigh has the largest budget in the Championship and are aiming for immediate return to Super League. I watched the game, Leigh went up 12-0 but Toronto clawed back to 12-10 at half and then came back and ran Leigh off the pitch. There have been some delays in renovations of Toronto's stadium. As such, they are on the road for three months and will then play three months at home. Rumour is Super League will expand to 14 teams next season. Some of the clubs are scared that Toronto will set the conditions for big spending foreign clubs to take over the game. There's a salary cap. How would they spend more than the other clubs? If they make it to SL they'll have the same problems as London did, which is that they'll have to pay the same salaries as the clubs in northern England to players living in one of the most expensive places to live in in the world. There are only around 5 clubs that can actually spend to the Salary Cap at the moment. Another rumour is that the Salary Cap will be increased. None of this is wanted by the RFL but the TV Networks have put their foot down. The opening game of the Magic Weekend is Toronto vs Toulouse. One of the biggest Rugby League events of the summer is being opened by two teams not even in Super League. Super League headed to Red Bull Arena in June? The the NFL Denver stadium will host an England-New Zealand match on Satuday 23 June. Wolfpack looking like contenders, might not make Super League this season but they aren't far off. So, I generally don't think we need to have a team full of Canadians to appeal to Canadians (that's been shown so far), but it's still kind of disappointing that they've loaned one of the few Canadians (Quinn Ngawati) to the Skolars.